This week’s Annotated Bibliography entry reviews an article by Jacquelyn Knoblock, a domestic violence survivor who examines the role of gender expectations in her experience of a violent intimate partner relationship. You may view the full text here. Knoblock, Jacquelyn. “Gender And Violence.” Human Architecture: Journal of The Sociology of Self-Knowledge 6.2 (2008): 91-101. SocINDEX with Full Text. Web. 17 Mar. 2015. 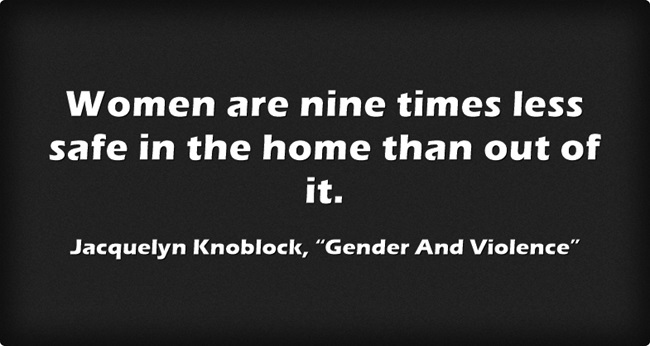 In this article, Knoblock explores “how gender ideologies and practices contribute to gender based violence” (91). She discusses issues such as the process by which human beings are classified as male or female, the stratification of genders in which “men are ranked above women within the same race and class,” and the structure of our society that dictates gender roles and determines whether certain tasks – for example, household chores – are considered by society as either male or female. Knoblock then connects these elements to the prevalence of gender based violence in American society. Women are nine times less safe in the home than out of it. In recent years, gender-based violence – specifically intimate partner violence – is gaining traction as a societal issue that is the public’s business, thus an issue that should be addressed rather than ignored. Gender based violence is not only a leading cause of injuries to women but is also an issue that affects the children who witness the violence and perpetuates the cycles of violence and general inequality that ultimately impact society as a whole. “Violence against women is a product of the oppression of women in most facets of life in most places in the world. Feminists see that there is a “continuum of violence,” meaning that all violence is interconnected, coming from the same social root of gender inequality and the resulting sexualization of women’s bodies” (92). While not very well written, this article brings up several interesting and valid points on the subject of gender based violence. I know there are a lot of “modern” American women who seem to believe that we are now equal and that feminism is no longer necessary. However, women are still very much oppressed and subjugated within American society, no matter how “advanced” we may like to view ourselves to be. As a society, we cannot ignore domestic violence and pretend that it has nothing to do with us as long as it is not happening to us. Domestic violence can be compared to slavery in the fact that there are more systems in place to perpetuate the violence than there are to prevent and/or stop it. Based on statistics alone, we must all admit to the fact that there is likely at least one woman in our very own neighborhood who is living her life as a piece of property. Her most basic human rights have been stripped of her. She cannot “just leave,” no matter how much society would like to believe that she can. We cannot pretend to be free when our neighbor is not. Until all are free, none are free. If you enjoy my scholarly writing, you might also enjoy my new book, Papers: A Master Collection on the Art of Writing. Buy your copy on Kindle today for just 99 cents! What Steps Should the International Community Take To Promote Gender Equality and Empower Women and Girls? Ever held the door for a woman? That’s because you’re a dirty, sexist, bigoted pig. What can we learn from the lives of male feminists?